This worked perfectly for my party! It was simple and traditional and worked great as a bright and colorful child-friendly costume for handing out candy to trick-or-treaters. I liked this costume much better than expected! I was just looking for something easy to use this year and I didn’t have a lot of money or time to be elaborate. I ordered it at the very last minute. I was pleasantly surprised to discover it was made of felt, rather than the foam or thin “slimy” material store-bought costumes are often made of. Because of this, it also shipped nice and flat and the plastic mailer was not damaged or torn, and it folds easily to be put away and stored. It is more like a large bulky sweater or shirt rather than a lumpy costume. I was surprised how small it was. I am a 5’2” woman, and it said it was adult/unisex/men’s, so I expected it might hang low or swim on me like last year’s “one size” costume I wore but I figured I’d make do. I wore it with black leggings like pictured and it fit perfectly. I love how bold and cheerful it is! This was definitely a winner I will keep and may use again. The costume was also very easy to put on (once I found the Velcro fastener to undo) and wear. It did not get in the way of eating or walking or using arms or hands. There was just one simple fastener at the back of the neck. I loved the leaf collar. Very attractive. All in all, it was functional, appropriate, not too cold or too hot (I was planning long sleeves but used a short-sleeve t-shirt indoors instead because it was pretty thick), didn’t have safety hazards, and easy to wear. These are all wins as far as costumes can go! 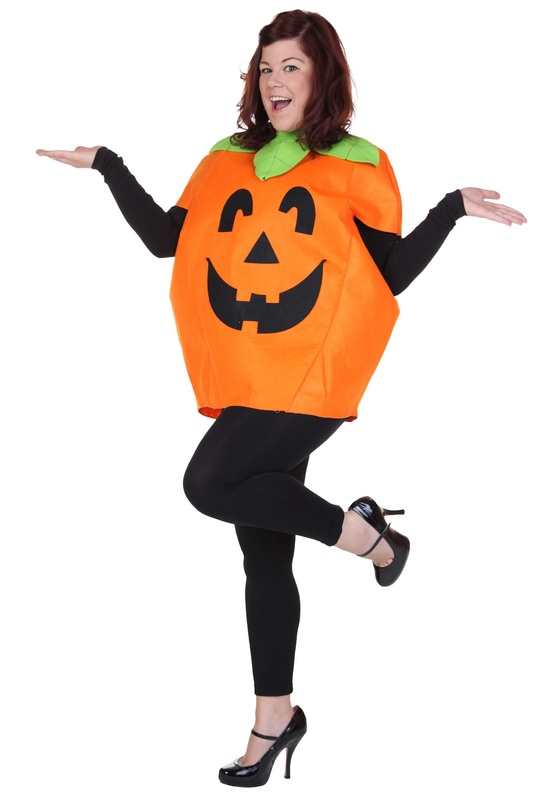 I ordered this costume for a work Halloween party. When it arrived in the mail one of the felt eyes had already fallen off. It appears to have been super glued to the orange felt pumpkin. When I wore the costume to work the other eye fell off. Pretty disappointed in the quality. I understand this is a relatively inexpensive costume but I would have expected the costume to stay intact before being worn and after one use. Guess I'm not a one size fits all yet. Reordered this costume. It's cute and I really liked it.